Uzume is the protagonist of the series Fantasista Doll which I just learnt is a show a little like Cardcaptors. Uzume competes in card tournaments then one day she is given a devise to bring the players on cards to life. There's a bit more to it than that however but I'll let you discover that for yourself. The figma features her in her school uniform and once again for me it was a case of an interesting character design drawing me in rather than being a fan of the series. She is a pretty accurate representation of her character as far as I can tell. 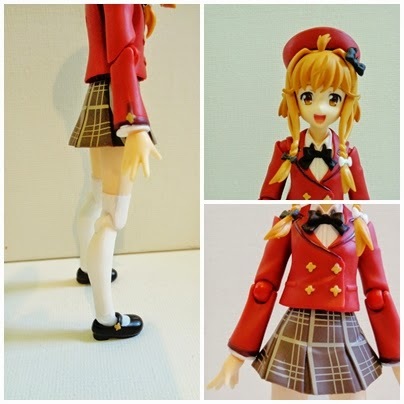 Her paint work is good as one has come to expect from a figma and she utilises soft plastic well, her braids, skirt, and jacket and this time her leg actually holds pretty well in a forward kick but not so much in a backward one. 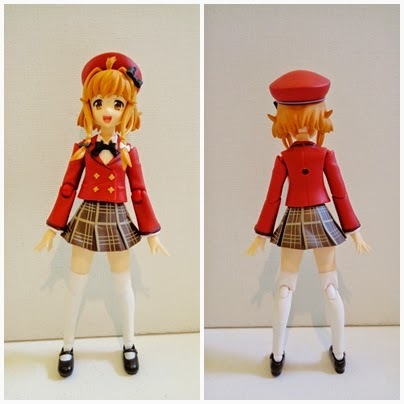 Also her hat is not attached via a peg like they typically are instead it stays in place because its moulded around her front hair piece and it sits fairly securely. 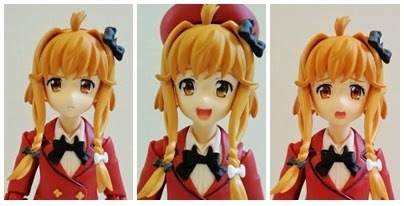 Uzume comes with three facial expressions a happy one, a frowning one, and a slightly worried looking one. 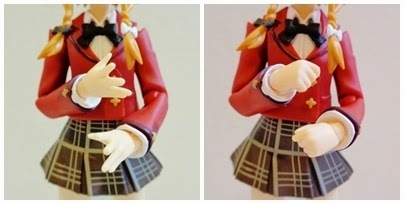 She comes with four pairs of hands included ones to hold her drumsticks. There are also three extra hands, a spare drumstick hand, a hand which is attached to her mobile, and a hand for holding her cards. 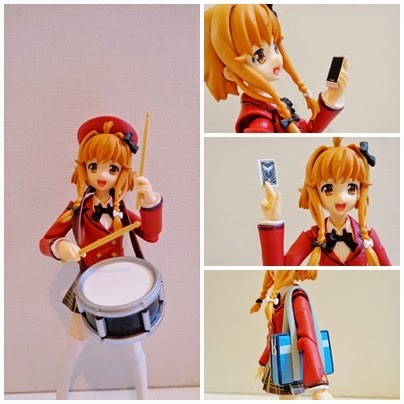 Her main accessories are her drum which you simply hang around her neck, her mobile, a school bag, and her card. Now the card comes as a blank piece of white plastic and you are given a sheet of stickers with the various player characters on them which you then have to stick yourself onto the plastic piece. I would have preferred them adding each card or perhaps maybe just one as a wholly complete piece as it was tricky to get the sticker of straight even with tweezers, furthermore the piece is slightly too big to fit firmly in her hand the only way I was able to get her to pose with it was using some blue tack. 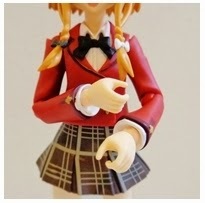 Despite some minor qualms Uzume over all is very good figure and it made to a high standard. She's cute has a good range of motion, was not too expensive, so I whole heartedly recommend her as an addition to any ones collection.